Volunteering Abroad – Good or Bad? 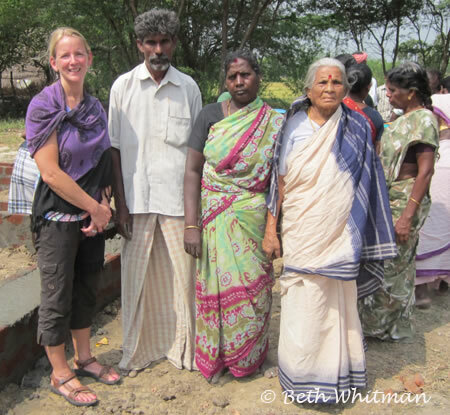 Me with family in South India – recipients of funds for a home being built for them through Passports with Purpose. One of my tour participants emailed me last week asking what I thought about volunteering in India. She was interested in returning after having gone on our North India tour this fall. She had read in a blog post (written by an expat living in India for nearly 20 years) that people should not go to India to volunteer. In essence, the reasoning is that there’s a lot of corruption in India and that there are more than enough middle and upper class people to take care of their own. Instead, we should volunteer in our own back yard because there’s plenty of work to be done at home. Mother India doesn’t need our help. While I agree with the assessment that corruption is rampant in India (as it is in many countries) and that there’s always work to be done closer to home, I have a few thoughts that favors volunteering abroad. You have to follow your passion in whatever way you’re moved to do so. Whether that’s half way around the world (carbon footprint be damned), or down the street. When you follow your bliss, you’re happier, you have more energy and compassion and you’re motivated to get out of bed each day to volunteer. Whether that “work” is in your neighborhood, city, state or country, OR it’s abroad, follow the direction in which you are being pulled. While volunteering for your local food bank is an excellent idea, if your heart isn’t in it, your interest will quickly wane and before you know it, you’ll be making excuses as to why you can no longer help. I’ve always maintained that travel opens up our world. When we return to our homes, family and community, we have a broader and (hopefully) more excepting view of the bubble of a community that we live in, as well as the whole planet. Travel (and volunteering) simply makes us better people as a result. In Buddhism, it’s taught that while actions matter, the intention behind those actions are just as important. While you might be able to convince someone to look for volunteer opportunities in their neighborhood, you can’t change their intentions of why they want to do good. To ask someone to put aside their intentions and refocus them elsewhere is unrealistic and unfair. Volunteering is just as much an opportunity to bring happiness to others as it is to bring satisfaction to ourselves because it allows us to share our compassion. We can all help in small ways. And travelers know better than anyone that small amounts of money can change the life of someone in a developing country because that money can go much farther. There’s a wonderful story about a man walking along a beach who is picking up starfish that have washed up on shore. There were thousands of them and one by one he’s picking them up and throwing them back in the ocean. Another man approaches and says something to the effect that what he was doing was futile because he couldn’t possibly save them all. But the first man states that it’s not futile for that one (or 2 or 3) starfish. Ever since my early days of traveling, I’ve found ways to give back to the communities I have visited. After a year-long trip around the Pacific Rim countries, I returned to Seattle and helped found (and was on the board for nearly 10 years) of a sister city organization between Seattle and Hai Phong, Vietnam. I helped raise funds each year that went into such things as building a playground at an orphanage in our sister city. I’ve also volunteered at home. For 9 years I was a Big Sister to a Vietnamese girl in Seattle, mentoring her through a terrible home situation, medical problems and also with her transition from living at home to being on her own. In the scheme of things, Passports with Purpose is only making a small difference in the world, but to the people who are the recipients of our funds, it’s life changing. So, my advice? Do what moves you. Give your time or money where you can. No matter what path you choose, there will be naysayers and those who want to rain on your parade. Ignore them and follow your bliss. Whether that takes you abroad or not, that’s up to you. But you’re going to have a hard time convincing me that volunteering anywhere other than your hometown is a bad idea. I find that volunteering abroad encourages me to volunteer when I’m at home. – Some volunteer opportunities are not what you think. Like some orphanages will take kids into their place that still have parents, just to make it seem like they need more help and money. And also, the after-effects of volunteering and playing with orphans can make their life unstable because they have to go through connecting with volunteers and having them leave all the time. – I know of some South African people who say (similar to the expat) that they don’t look well upon people coming to volunteer in their country. But you might find that in every country you go to. – I think the most important factor is finding an organization or opportunity where the majority of your money is going to the funds that help the people, rather than the organization. I had a friend go to India to do volunteer work. She absolutely loved the experience. It gave her an affordable way to go there with somewhere to stay and be feed as part of the program. She also liked the connections she made with people in the village as she worked side by side with them to help make bricks and build homes. It’s inspired me to think about trying a volunteer trip myself someday. While I think you make many good points, I think your emphasis on ignoring the criticism is exactly the problem with foreigners volunteering! All too often the problems that come with the volunteers are ignored. Yes, there are really good things that can be done. But there is also a lot of harm that is being done by well meaning volunteers. Good intentions are NOT enough. Not at all. Do you know that you’re not putting a local out of a job? Do you know that you aren’t creating more social problems than you’re fixing? For example, many so-called orphanages have children parading around as orphans so that the adult can make money off of volunteers – or families giving children to orphanages to money because “westerners” will pay to volunteer. Do you know if the solutions that you are proposing are the ones that are needed? People love to build hospitals, schools, libraries – but what is needed in most of htese contexts is the people to work in these buildings, the supplies to be housed in these buildings. There are tons of empty buildings in Africa because nobody bothered to ask the locals what they actually needed – and they don’t have people or supplies to do the work intended in those buildings. These are only a few of the questions that are essential to be asked. I would like this post FAR better if you had acknowledged any of these potential problems. It’s really sad to me for someone to say “Ignore them” when questions are asked! You know what, Ellen? You are quite right. I don’t want people to think that they should blindly accept a volunteer opportunity without looking at the pros and cons to the program. I took it for granted that people WOULD do that research in advance. The point I was trying to make was more about whether a person should even volunteer abroad in the first place. I don’t think you are arguing against that (are you?). With Passports with Purpose, we do a lot of research into the beneficiary of our yearly fundraiser. If I were to volunteer abroad I would apply the same scrutiny to a program I might join. But the point of my post was that I don’t believe it does anyone any good to suggest we should not volunteer abroad (or in the case of PwP provide funds for programs abroad). Glad to hear it. But the fact is that a whole lot of people blindly accept volunteer programs, and a whole lot of people organizing volunteer programs are in it for the money and with a “white man’s saviour complex” so that they do just ignore many of the issues that I have raised. It only takes a quick google search to find out that voluntourism is frought with problems. There is also a growing body of academic literature that reports these problems. These studies also find that volunteering abroad is often done to boost a resume or a grad school or med school application. So am I suggesting that people not volunteer abroad? Well, yes, sometimes. If they can’t be bothered to learn about the local cultures, needs, and possible solutions generated by locals, and if they are doing it simply to boost their resume or applications – then yes – please, I wish they would stay home and don’t create more problems than they are fixing. Resumes and grad school applications can also be boosted by helping impoverished communities at home! But if they are taking skills that locals are asking for, if they have proper pre-departure training, if they have the proper supports in place to help deal with culture shock and other issues, then sure, go ahead. It’s just not a simple issue, and I think that putting out a blanket “ignore them” message doesn’t really help much. So your additional comments are nice to see. I guess these problems like “families giving children to orphanages to money because “westerners” will pay to volunteer” do exist but its not only in India. These types of issues can exist in any place. If we really want to volunteer and think that what we do is actually benefiting the people who need it, we need to do a research behind that. I also volunteer at my home(India).And we do only after being satisfied that our help is going to the right people.